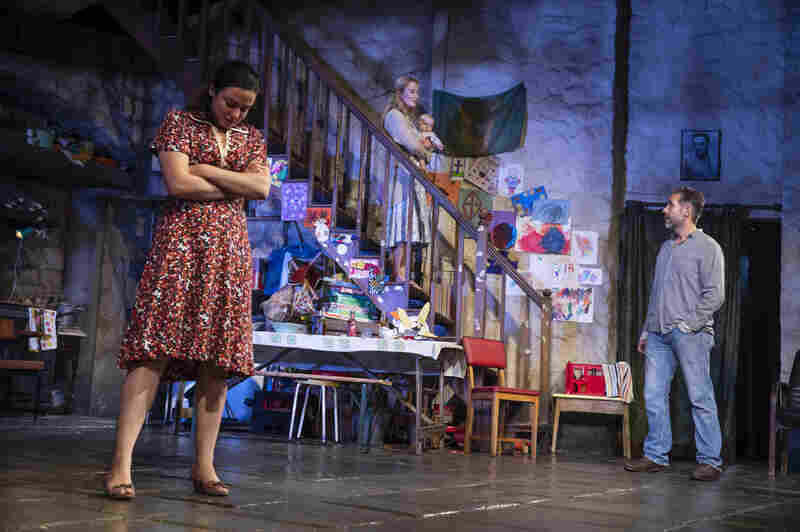 Northern Ireland's Troubled Past Surfaces In Family Drama 'The Ferryman' In the latest Broadway play by Jez Butterworth, the body of a man who was violently "disappeared" 10 years ago has been found in a bog. It augurs bad things for the dead man's family. The Ferryman follows the large family of a man who was "disappeared" in the Northern Ireland conflicts of the late 20th century. Paddy Considine (standing) plays Quinn, the head of the family and the brother of the dead man. The Ferryman starts in a graffiti-covered back alley in Derry, Northern Ireland. A parish priest is questioned by an IRA captain — the body of a man who disappeared 10 years ago has been found in a bog. The scene then shifts to the dead man's family and their farm. It's harvest time, 1981, and despite the joy and warmth abundantly on display, the first scene looms in the background. "Well, it's appropriate that it takes place at harvest time, isn't it?" says Ben Brantley, drama critic of The New York Times. "Because people are reaping what they've sowed." Brantley says even though the play is set in a turbulent Irish past, it speaks to our American present. "In a time when we're considering our own divided nature in this nation, The Ferryman reminds us of just what kind of toll such divides can take not only on a country, but even within a family," he says. 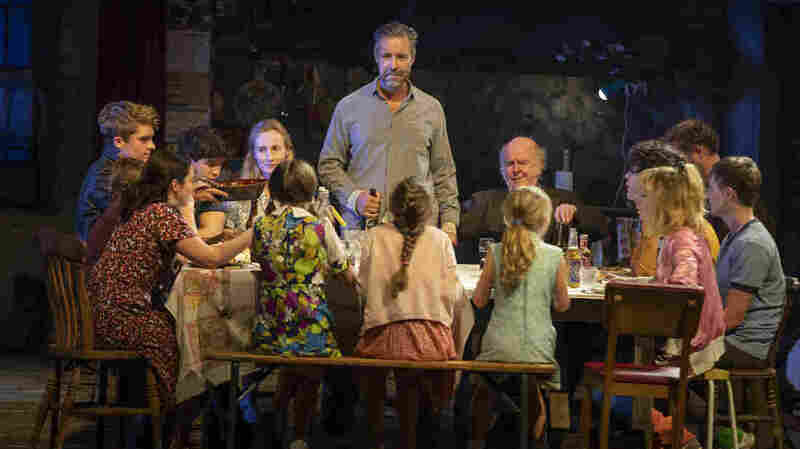 The Ferryman is the latest from English playwright Jez Butterworth. It's over three hours long, and features 21 actors, a real baby, a rabbit and a goose. The current Broadway production, directed by Sam Mendes, got rave reviews from Brantley and other theater critics. Butterworth writes big plays which tackle big issues. He's taken on the state of the English nation, as well as deceit and paranoia in the seemingly placid suburbs. This play deals with the disastrous effects of conflicts in Northern Ireland – the "troubles" of the 1970s and '80s — on a large rural family. Specifically, it looks at the family of one of the "disappeared." Belfast-born actress Laura Donnelly explains. "They were a group of people who — through the course of the '70s and '80s in Northern Ireland — were abducted, secretly murdered and buried," Donnelly says. "And the families of those people weren't told anything about what had happened to them." Donnelly plays the late wife of the man whose body has been discovered. She knows the scenario all too well. Her own uncle was one of the disappeared, and her family was deceived by the Irish Republican Army. "The families were purposely misdirected, and received letters from those loved ones, and received stories from people who they knew well, to say that they had been spotted in different places," she says. "You know, spotted in England, spotted in America. And rumors were spread as to why they had been abducted — and most of them, it was claimed at the time by the IRA, had been informers." After her husband was "disappeared," Caitlin (Laura Donnelly) goes to live with her brother-in-law Quinn (Paddy Considine) and his wife Mary (Genevieve O'Reilly). Donnelly shared her family's story with her partner, playwright Jez Butterworth. "What happened to Laura's family in the actual disappearance of someone physically --where you don't know where they are, you don't know if they're dead or alive, if you're going to see them again, if you should begin a process of mourning them or not — you're just in absolute stasis," he says. Then he and Donnelly attended two funerals in Belfast, of people whose bodies had recently turned up in shallow graves. "And there I was, in a cathedral in Belfast watching a casket be ferried in of a 17-year-old boy who died in 1971," Butterworth says. "And his friends from school and his family are all in their early 60s. The idea of someone just arrested in time, but that is being buried today, seemed to me to be, I think up until that point in my life, the most dramatic thing I'd ever witnessed." Yet he resisted writing about it. "As an Englishman it just struck me as a fool's errand and I could appreciate what all the problems of that were," Butterworth says. "And it felt like their business – it felt like her business and it felt like their business. And so I did everything I could to resist it. But it wouldn't leave me alone. "And then Laura came to me one morning and said that she was pregnant, and I knew that one of the parts in this was meant for her. And I'd been avoiding the topic for so long. And like a fool, I said, 'Well, I will write you that play.'" It's also a play about family and a man trying to keep his together, even as his past could walk through the door at any moment. Actor Paddy Considine plays Quinn, the head of the family, and a former IRA soldier. "When I read Quinn, I just I could see a man in front of me who was trying to start a new life, trying so much to be a different man to the one he used to be," Considine says. "Trying to shed his past, almost bury his past. But you can't do that. Ultimately, you know, whatever you're trying to suppress it will come for you with bloody hands, you know. It will come and get you." Laura Donnelly says she doesn't think The Ferryman is about politics as much as it is a family story. Still, it's personal to her. "It's been 50 years, essentially, since the troubles began in Northern Ireland," Donnelly says. "And I was watching a documentary, and at the end of it, one of the women said that we have to tell our stories — and even if it's not us, our children or our children's children — until it gets told. And that really moved me because I thought the whole reason that I got into doing this was to tell stories. And to be able to tell one that is truthful to me, and really means a lot and means a lot to my mother, is kind of the whole reason I do this."